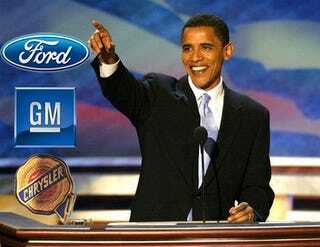 Presidential candidate Senator Barack Obama (D-Second Coming), in a letter to UAW officials last Friday, endorsed a plan to push through $4 billion in aid to prop up the Detroit Three. The package of tax credits and loan guarantees is a proposed part of a second (and real) economic stimulus package working its way through congress for a September vote. Those billions would then be used to secure up to $25 billion in loans, which now starts to look like some real big-boy money.